Number of Adults should include all occupants 18 years of age and older. All guests registering must be 18 years of age and must present photo identification upon check-in. Children 2 years of age and under are free when occupying the same room with an adult family member. Two (2) persons may occupy a room. There is an additional charge for additional occupants. Children 2 and under stay free when occupying the same room with an adult family member. Children over the age of 2 will be charged as an additional person. The online reservation process provides rates and room types to accommodate only the adults indicated on your reservation. It does not consider any children that you will be traveling with. Please make sure that you reserve a room that provides the number of beds to accommodate each guest (adults and children). You can indicate the number of children traveling with you on the booking page under Additional Information. Sleeping bags, cots, or furniture of any kind may not be placed in a Park Motel and Cabins room by any guest. Park Motel and Cabins does not accept money orders, cashiers checks or checks as form of payment. Room charges are paid at registration or by 12 Noon in advance of each subsequent night's stay. Payment may be made with cash, traveler's check or with credit card (American Express, Discover, MasterCard or VISA). Advance payments may be made with cash, credit card, or traveler's check. Arrangements for 3rd Party Credit Card billing must be made by calling the Park Motel and Cabins directly at least 5 hours prior to arrival of reservation. Guests who check out early who and have booked with special offers/discounts are not eligible for refunds. Military rates, corporate rates or discounted rates with coupon numbers are not valid with other special rates or discounts and may not be available during special events. Service animals and well-behaved dogs always stay for a flat rate of $25.00/room/pet for the 1st night and $15/room/pet/night for each night after. Dogs are permitted unless they pose a health or safety risk. Pet limit of 2 pets per room. Undeclared pets found will be charged at a rate of $150.00/pet plus the above stated pet fees. Animals that pose a health or safety risk may not remain onsite and include those that, in our managers' discretion, are too numerous for any one room, cause damage to our property or that of other guests, are too disruptive, are not properly attended, or demonstrate undue aggression. Animals that assist the disabled, known as "Service Animals," are always welcome. Like pets, however, any Service Animal that poses a health or safety risk may not remain onsite. Please be considerate of other guests when walking pets on the property. As a courtesy to other guests, clean-up after your pet. There are "poopy" stations throughout the property. Please use them. In consideration of all guests, pets must be on a leash and attended to when outside a guestroom. Pets should not be left alone in a room or automobile. Due to safety concerns for our employees and your pet, we will not service a room with an unattended pet. All rooms at the Park Motel and Cabins should be serviced every day to maintain health and cleanliness standards. With extended stays at Park Motel and Cabins, rooms should be serviced twice per week. If unavoidable circumstances require a pet to remain unattended in a room while the owner is offsite, the pet must either be secured in a crate or travel carrier or you must notify the front desk that your pet is roaming freely in the room and what timeframe housekeeping is permitted to enter the room when the pet will not be present or when the pet is secured. All rooms at Park Motel and Cabins should be serviced on designated days to maintain health and cleanliness standards. Park Motel and Cabins reserves the right to access rooms every day for housekeeping, maintenance and safety and security. If your pet has an accident (they do happen) in your room, please notify management so they can take cleaning remediation actions. If you fail to comply with the above and your unattended pet prevents our staff from servicing your room, you may be asked to vacate the property. Park Motel and Cabins will make every effort to honor special requests when you make your reservation. However, the availability of these items cannot be guaranteed in advance. The Park Motel and Cabins does not allow smoking in our rooms do to fire hazard. Smoking is permitted outside of the building. If a guest has been smoking in our rooms, they will incur a $100.00 cleaning charge. The Park Motel and Cabins brings you that retro roadside motel with a camp flavor that will keep you coming back every year. We at The Park pride ourselves on our ultra clean rooms each with its own unique flavor. Whether you are staying with us for an overnight or an extended stay our promise is to provide you with a rustic, friendly experience that is hard to find. Each or our rooms is a unique rustic experience surrounding you in knotted pine taking in the woods the property is centered on. Our seasoned guests all have favorites and after a couple stays with us, you'll have yours as well. 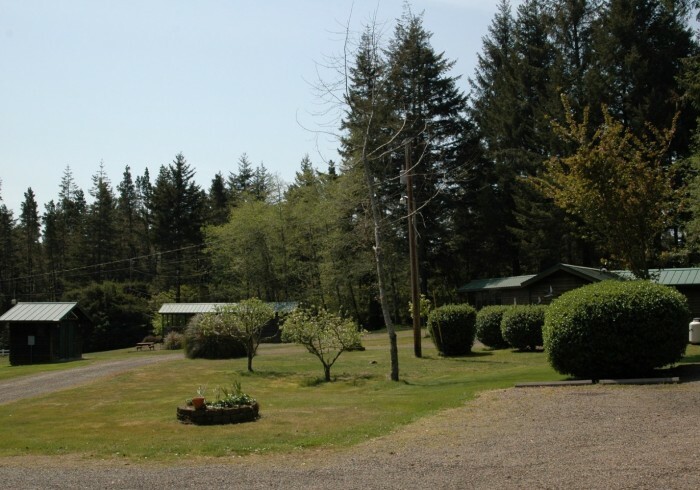 Whether you're a couple looking for a quick get away or a family exploring the Oregon Coast, The Park promises you an ultra-clean room with all the modern amenities in retro style at an affordable price. The Park is a family friendly environment for both children and your favorite 4 legged friends. We also have on site laundry for those especially dirty days fishing or running your ATV on the sand dunes. The Cabins, nestled amongst the trees, have two bedroom with private covered porches and can sleep up to six (6) guests. You get all the comforts of home with fully equipped kitchen with over-the-counter microwave, full-sized refrigerator, oven and cook top plus all the utensils. Ask about our"Little Cabin in the Woods" Private A-Frame Chalet, sleeps up to 8. Pricing is based on double occupancy. There is a $10.00/night charge for each additional person including children. Please note that if you are bringing your furry friend, there is a $25/night charge and must be registered at the time of check-in.